The Gazprom project company has filed a second route to Danish authorities, in case its first gets rejected - but that hasn't happened to date. 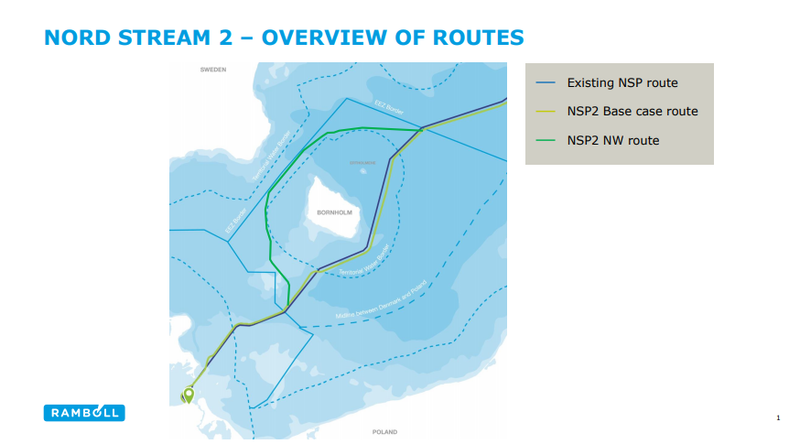 The Gazprom wholly-owned Nord Stream 2 project company (NS2) said it filed an application and Environmental Impact Assessment (EIA) report to Danish authorities August 10 for a 175-km route passing through Denmark’s exclusive economic zone (EEZ) to the northwest of Bornholm. This is an alternative route that does not pass through Danish territorial waters, said NS2. “Nord Stream 2 AG is not withdrawing from the ongoing procedure [filed April 2017] for the preferred route as applied for in April 2017,” the company said. That route does cross Danish territorial waters. To date, NS2 says it has received the national permits from all other national jurisdictions through which the pipelines pass between Russia and Germany. An NS2 spokesman told NGW it has not received any rejection from Denmark in respect of its original route. NGW also contacted Denmark’s foreign ministry August 10 for an update on its decision-taking process but has yet to receive a response. OMV finance chief Reinhard Florey said already on August 2 that a back-up route existed and that NS2 could still be built within its original planned €9.5bn cost ($11bn). The Austrian oil and gas firm is one of the five western European gas groups providing Gazprom with financial support, something the Polish authorities have vowed to challenge legally. NS2 would carry 55bn m3/yr Russian gas directly to northeast Germany upon completion, which its backers still say they expect late 2019. The line could make existing transit routes via Ukraine redundant, so EU mediators are trying to persuade Russia to not pull all its gas transit business away from Ukraine post-2019 while seeking equivalent guarantees from Kiev for the Russian side. The US, Poland and Ukraine have called on EU politicians to block the NS2 project, while the five western European gas groups backing NS2 are just as vocal in demanding no "outside political interference." Much of the route will shadow the route of the existing operating 55bn m3/yr Nord Stream pipeline. If NS2 is built, it will mean Gazprom has 110bn m3/yr of delivery capacity direct to northeast Germany.